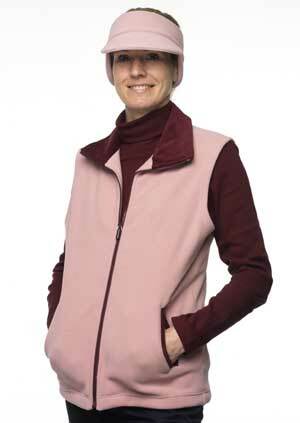 A fleece gilet from Valerie Herman that has a smart cord fabric trim on the collar and pockets. Available in three different colours, the cord trim is a contrast wine colour in the pink version (see picture), but matching Navy and Black in the other two colourways. Two front pockets and zipped through front. Wear with our matching roll necks.